Clapham Common is a London Underground station in Clapham within the London Borough of Lambeth. It is on the Northern line, between Clapham North and Clapham South stations, and is in Travelcard Zone 2. The station is at the eastern tip of Clapham Common and was opened in June 1900 as the new southern terminus of the City & South London Railway, which was extended from Stockwell. It remained the terminus until the Morden extension was opened in 1926. The station has two entrances, one at the west via a domed building dating from the 1920s, and one at the east via a modern curved-steel and glass pavilion. Clapham Common is one of two remaining deep-level stations on the underground that has an island platform in tunnel serving both the northbound and southbound lines, the other being Clapham North. 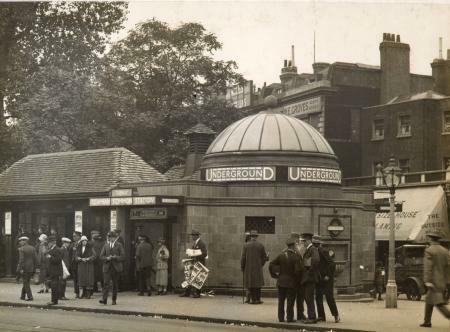 Clapham Common is one of eight London Underground stations that have a deep-level air-raid shelter underneath them. Both entrances to the shelter are north of the station on Clapham High Street. Train frequencies vary throughout the day, but generally operate every 2–6 minutes between 06:09 and 00:21 in both directions. The station is served by London Bus routes 35, 37, 50, 88, 137, 155, 249, 322, 345, 417, 689 and 690, and by night routes N137 and N155. For 2 weeks in September 2016, all of the adverts used in the station were replaced by photos of cats. This was an initiative paid for on crowdfunding site Kickstarter and organized by an organisation called The Citizens Advertising Takeover Service (C.A.T.S). In January 2017, as part of the initiative Veganuary, PETA took over the station informing and encouraging commuters to adopt veganism for the month. ^ a b Historic England. "Entrance Building to Clapham Common Tube Station (1065005)". National Heritage List for England. Retrieved 3 April 2015. ^ Standard Tube Map (PDF) (Map). Not to scale. Transport for London. March 2019. Archived (PDF) from the original on 5 April 2019. ^ "Northern line timetable: From Clapham Common Underground Station to Clapham North Underground Station". Transport for London. Retrieved 6 March 2015. ^ "Northern line timetable: From Clapham Common Underground Station to Clapham South Underground Station". Transport for London. Retrieved 6 March 2015. ^ "Buses from Clapham Common" (PDF). Transport for London. July 2014. Retrieved 6 March 2015. ^ "Crowdfunding Replaced The Ads At A London Underground Station With Cat Photos". Jalopnik. Retrieved 20 September 2016. ^ "The Citizens Advertising Takeover Service (C.A.T.S)". Kickstarter. Retrieved 20 September 2016. ^ Scott, Ellen. "PETA has replaced every advert in Clapham Common tube station with pro-vegan posters". Metro.co.uk. Retrieved 8 February 2017. Wikimedia Commons has media related to Clapham Common tube station. This page was last edited on 19 February 2019, at 20:51 (UTC).